I believe it’s fair to compare the relative skill difference between a graduating civil engineer and a 10-year PE (or SE) with the difference between a tennis hobbyist and a pro. The hobbyist and student can know the rules of the game and perhaps some time-tested techniques, but their execution cannot match the pro. Sportswriter, Todd Gallagher wrote an article in 2008 about challenging Andy Roddick to a singles game, but giving Roddick a frying pan instead of a racket as a disadvantage. Even with the frying pan Roddick played competitively. 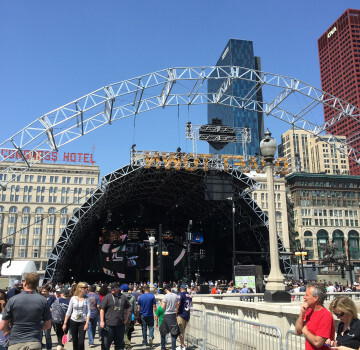 Last weekend I attended the NFL fan zone at the draft in Chicago. The setup was impressive – the atmosphere felt like a mini-Super Bowl. As a structural engineer I was more enamored of the massive temporary structures than the hall of gamers giving autographs. Included in the festival were a series of stations allowing fans to test themselves against NFL combine standards. A friend tried to relive past glories by running the 40-yard dash. This event also reminds spectators how far physically they lag the super-humans that play in the NFL. Walt Hickey of FiveThirtyEight.com was able to compare his every man’s skill to the NFL game by convincing the programmers at EA Sports to make an avatar based on his skill. Even in the virtual world the average man has no chance. Read the article here. Even though teams meticulously measure the physical attributes of draftees and check out their body of collegiate work, they often miss the mark. Some positions, like running back, are considered so hit and miss that a back is now seldom taken in the first round (although two were taken this year). Judging quarterbacks is hardly any easier. Tom Brady was famously taken in the seventh round of the draft and now stands at the pinnacle of the profession. It’s likewise difficult to assess engineering talent. Interviewees for structural consulting positions in my division are not subject to any technical tests. The fact of the matter is that another standardized test would not offer much beyond what we already know from college performance. We expect that entry-level engineers will learn most of the things they need to know on the fly. An engineer that works well in teams, takes direction, and is eager to learn beats the valedictorian of the class in my book. My worst hiring experiences have been with students with advanced degrees who thought they knew it all. I assume you’re familiar with at least one can’t-miss draft pick that washed out of the league. Projecting long-term acumen is even more difficult in part because the rules keep changing throughout the career. My company has just instituted a new review platform that formalizes this changing skills landscape. For me technical competency barely registers on the evaluation, and to the extent that it does- it’s intended to be the softball. I’ll be much more critically evaluated on team management and handling of project financials this year. Don’t expect to read the tealeaves on a new recruit for these skills. 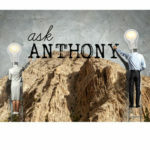 The changing career landscape has prompted one of my colleagues to offer the wisdom that the only thing of value school teaches is how to learn. You never stop learning on the job. My reasoning came full circle the other day as another of my teammates was working on a monumental concrete stair for a new project. Experienced engineers know that stairs are among the most complicated elements of a new design because they require such close coordination with architectural requirements. The rise and run of each step, the height and spacing of the handrails, the head clearance, the space for rescue assistance, the fire protection, the entry door swing, and more play into the design. Plus, many architects will view stairs as an opportunity to make a design statement. As simple and familiar the function of stairs, they quickly trip up novice designers. Recent grads have all the tools, but putting together the methods and foreseeing complications comes with experience. On our stair project, we started with simple hand-calculations, but found the estimates unsatisfactory for fitting the depth of the stair in the available space. So I encouraged the development of a finite element model. This gave better results, but we then had to apply the long-term affects of creep and shrinkage in the concrete. In other stair designs we’d also typically look at the mass and deflection to see if vibration would be problematic. Finally, there’s the matter of placing the rebar properly in the section to achieve the strength design and prevent spalling from wear. My experienced colleague ran through these design concepts in about a day, but inexperienced engineers could spin their wheels indefinitely on such topics. So if you’re planning to put a price on design consulting for stairs, consider the available staff, and expect a longer than expected time commitment. New recruits in engineering and sports are essential to maintaining a strong and fresh team. In the same way NFL teams participate in the draft each year, my company annually brings on new engineering graduates. We both use metrics for evaluating talent, but it’s often hard to anticipate how this will translate throughout a career. The key for the rookie to recognize is that the mountain is still before them to climb. Much can be learned from the experienced engineers. With that guidance the engineer will actually get faster, stronger, and better. It should be comforting to young engineers that the profession has no ceiling based on physical limitations. And even with an abacus in tow, the layman has no chance. Great article! Encouragement and proper mentoring of young engineers is the key in keeping this industry advancing in the right direction. Best of luck as an Associate at TT, I’m sure you are going to do great!